Last edited by golfnut69 on Thu Jul 19, 2018 12:16 pm, edited 1 time in total. 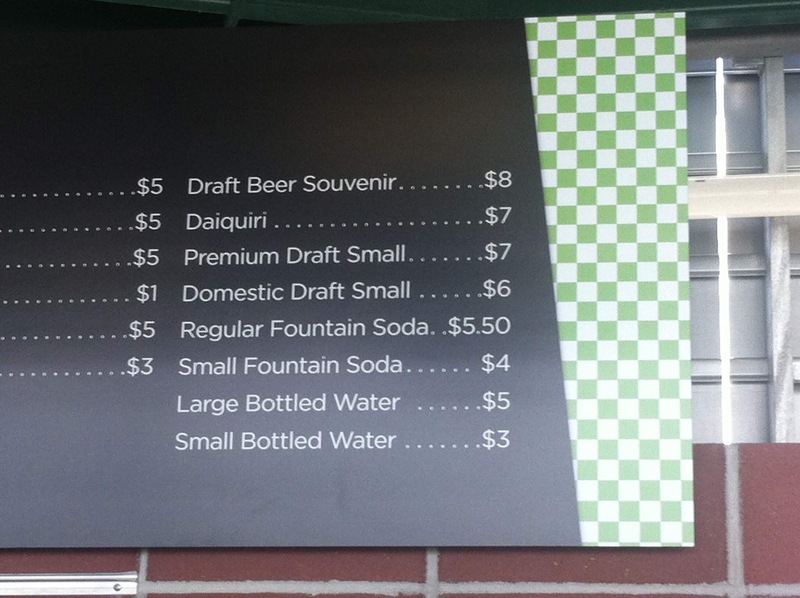 Does anyone know what Tulane's prices are? Anything to make the games more “family friendly” is a good thing. I’m even old enough to remember when there were plenty of kids at Saints games played @ Old Tulane Stadium. Today it is so damn expensive to go to a Saints game. NFL football across the country has become a "corporate event." Too much demand from the expense account driven customers who can write it off to actually buy tickets for a family. Taking my two sons to a Giants game, just the three of us, would be well over $500. If I wanted seats between the 30 yard lines, it's probably over $1k. the price list from Jerry world....also note it cost 60.00 for a Pappa Johns Pizza...and a paltry 75.00 to park...what a bargain !! Astros have $1 Hot Dog night on Tuesday’s. I prefer watching women's tennis to men's in spite of the sub-par execution (I can actually see the ball), I enjoy watching high school & NCAA football because I like watching a wing-T vs a veer & an RPO vs wishbone. The NFL execution is amazing but from a strategy & tactics perspective, the NFL is boring. It's pro-scheme all the way with a little rpo sprinkled in here and there. The worst thing about the NFL is the ridiculous extent that they have ramped up measurables (offensive statistics), to appease the knucklehead fan base and, even worse, fantasy football morons. I like the NFL. I play in a fantasy football league that will begin our 31st season this year. It was A LOT more fun before the internet. Call us morons, but we know more about the game and it's players as a result. Frankly, there's a whole lot of football fans that love the NFL and love FCS football over FBS. There's a champion crowned and recognized by the NCAA, rather than the ESPN Invitational Tournament that crowns an unrecognized FBS champion. The level of play, particularly when you get deep in the FCS playoffs is close to FBS. And the level of play at the NFL level is like (and I am using a Bill Cowher analogy here) "going from a state road to the autoban" comparing college football to the NFL. 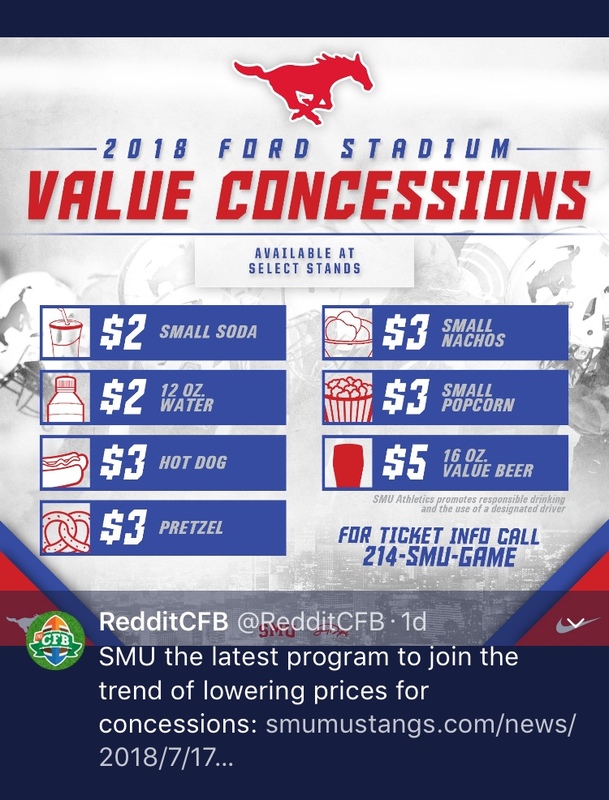 What this has to do with SMU concessions prices I don't know. I watch women's tennis because they're more attractive and make noises that I enjoy! But I rarely watch an entire match. And I haven't watched a whole NBA game in 15+ years.